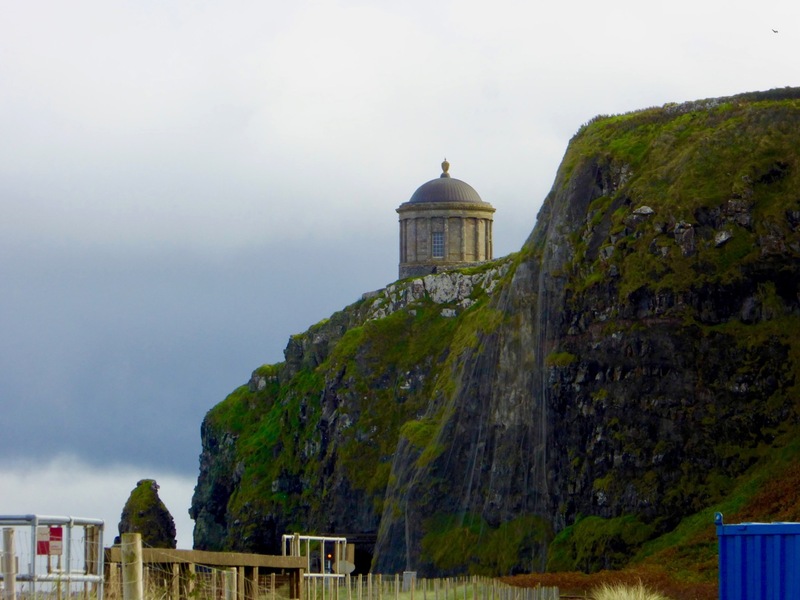 Finola had always wanted to visit Mussenden Temple and the ruins of the nearby great house on the Downhill Demense: it’s only a few stones’ throws from Nead an Iolair, so off we went on a stormy Sunday – the first day of October. The house was built by the eccentric Frederick Augustus Hervey (1730-1803). Being the third son of the even more eccentric Lord John Hervey, he did not expect an inheritance and tried law (unsuccessfully) before entering the church. His eldest brother George was appointed Lord Lieutenant of Ireland in 1766 and, although he never set foot in the country, he managed to engineer Frederick’s appointment as Bishop of Cloyne then, shortly afterwards, Bishop of Derry, one of the wealthiest Irish sees. 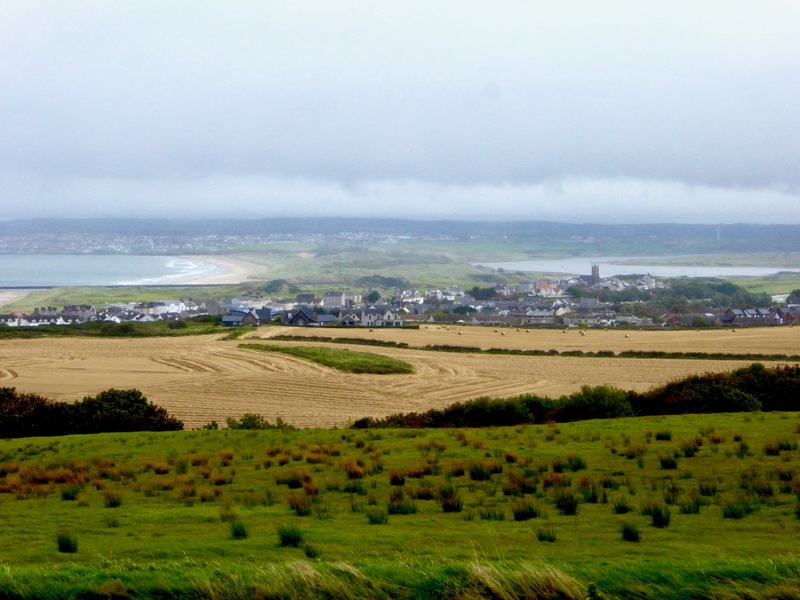 While in this post Frederick had the notion to establish a huge estate (apparently with the help of Diocesan funds) on a windswept clifftop overlooking the Atlantic Ocean in Dunbo, County Londonderry – now Northern Ireland. Dunbo derives from the Irish Dún Bó, meaning ‘fort of the cows’. It looks bleak today, and must have been in the Bishop’s time, although his plans for the new demense included classical landscaping and the planting of 300,000 trees: there’s not much sign of them now on that windswept terrain. Both of Frederick’s older brothers died without leaving heirs and, in 1779, he found himself the Earl of Bristol and in control of a considerable fortune which helped greatly in the realisation of his plans for the Dunbo project, which he named Downhill Demense. Everything about the Earl Bishop and Downhill Demense is ‘over the top’. Even though it is now a ruin, cared for by the National Trust, its former splendour is obvious. 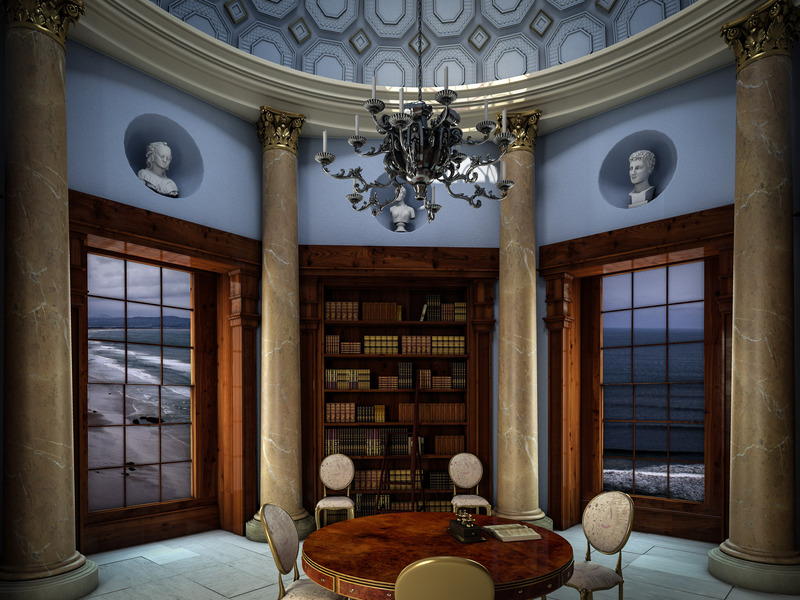 The residence was huge and grand, and Frederick went through a number of architects (beginning with Michael Shanahan of Cork) and including Placido Columbani from Milan, who was supervising plumbing and the installation of water closets – a considerable innovation at the time. 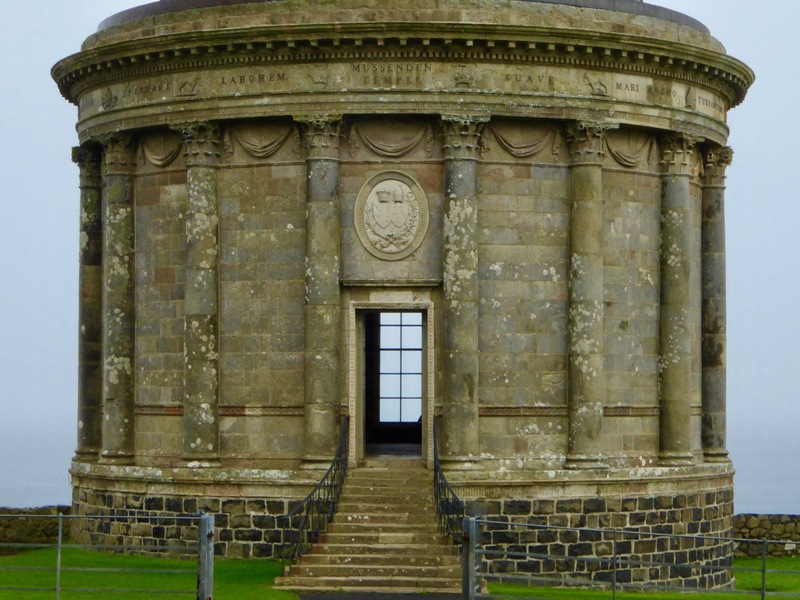 One of the most striking surviving buildings at Downhill is the Mussenden Temple, based on the Temple of Vesta at Tivoli, near Rome. It was built close to the cliff edge, but with enough land to enable a horse and carriage to be driven around it. 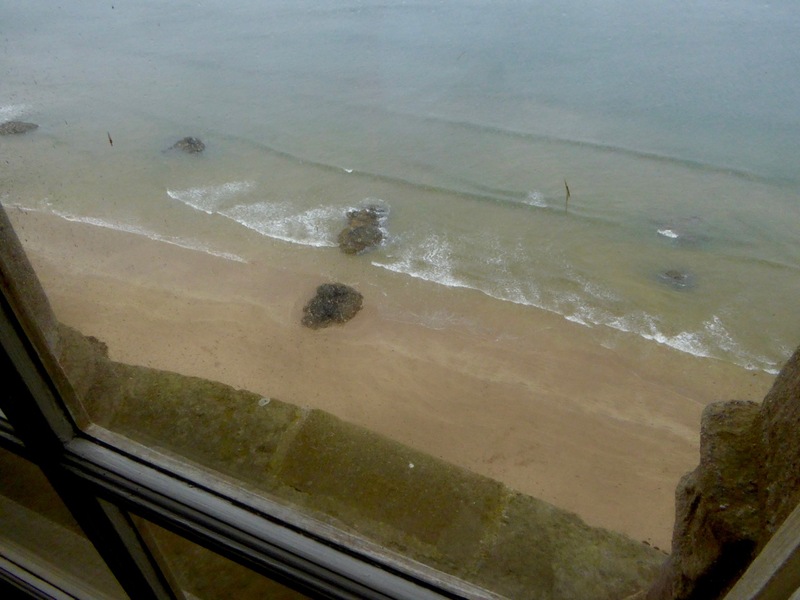 When we looked out of the windows facing the sea we were shocked to see that the building is now teetering right on the cliff edge! Also, a railway line runs right underneath it near sea level, over 100 feet below – you can see the tunnel entrance in the header picture above. The Temple was an ‘overflow library’ to the house, some distance away. It was constantly heated by a fire always burning in the basement room below, so the books didn’t get damp. 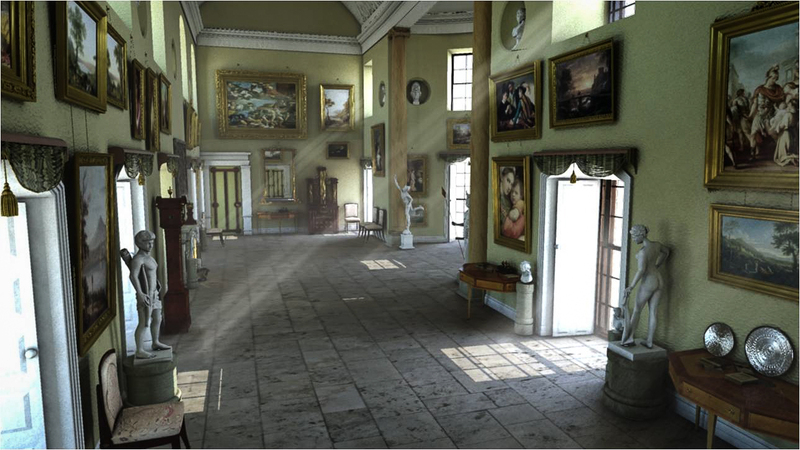 The Earl Bishop was a great traveller and collector, and in its heyday the house was full of paintings, statuary and furniture. 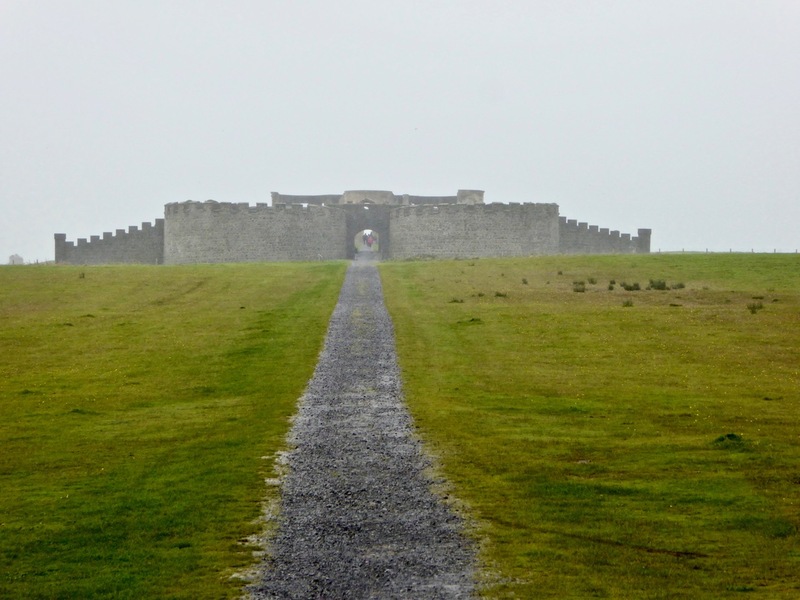 Students of the Northern Regional College together with the Arts Council of Northern Ireland, the University of the Third Age and the Earl Bishop Heritage Trail Group have put together a wealth of information and some reconstructions of the house, included here. Their website is a mine of good information. 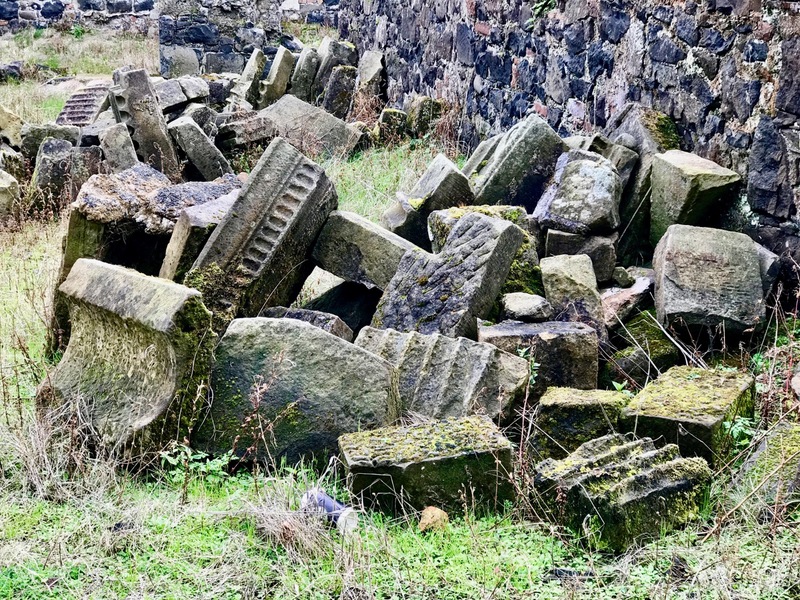 It’s sobering to stand in the driving rain – as we did today – on this deserted site and imagine the treasures that were once on display in this great edifice. On the Earl Bishop’s death the Demense passed to his cousin. 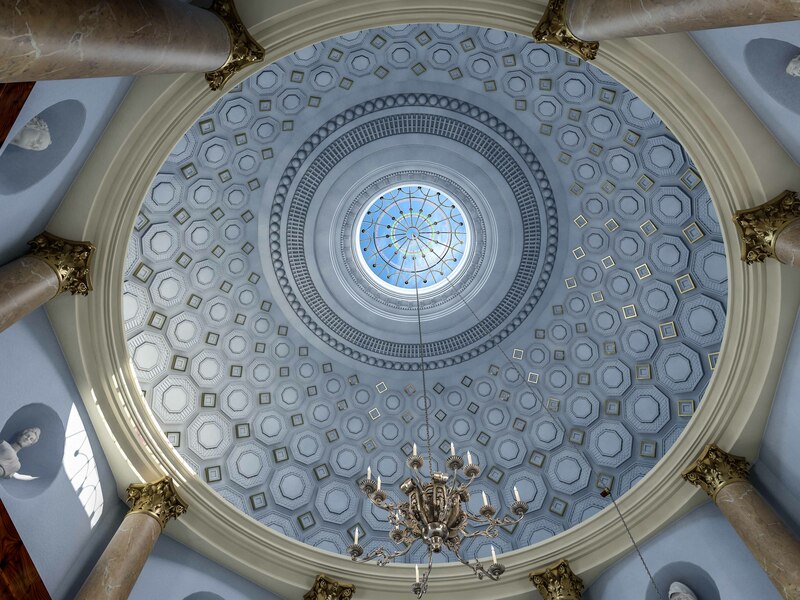 It stayed in the family and survived a devastating fire in 1851, although restoration was not completed until 1876. The family left the house in the 1920s and in the 1930s the house was empty and had been stripped of furniture. During World War 2, Downhill was requisitioned and occupied by the Royal Air Force. In 1946 a request was made for permission to demolish the building, thus avoiding a large rates bill. 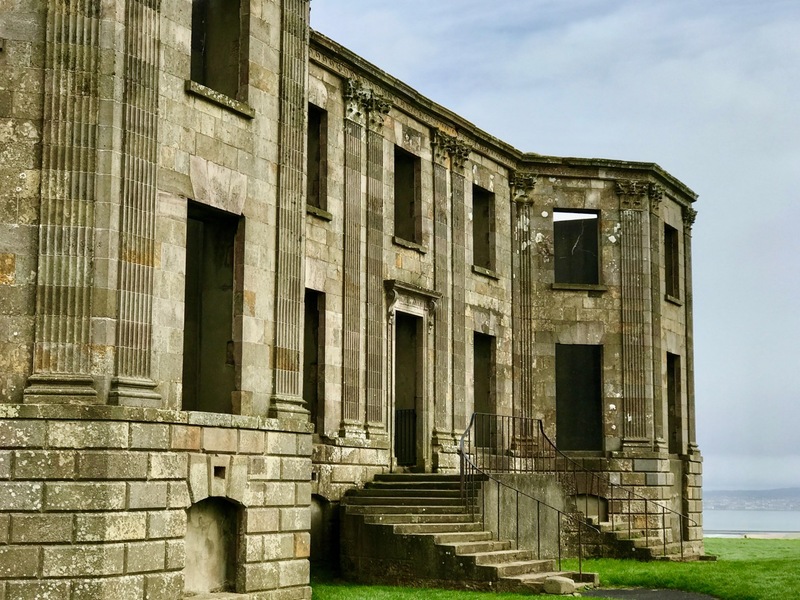 Consent was refused because …the castle is of general local interest… A tenant was found – Mrs Belgrave – who was the last person to live in the house – but briefly; by October 1949 the entire property had been gutted and the windows and roof removed. 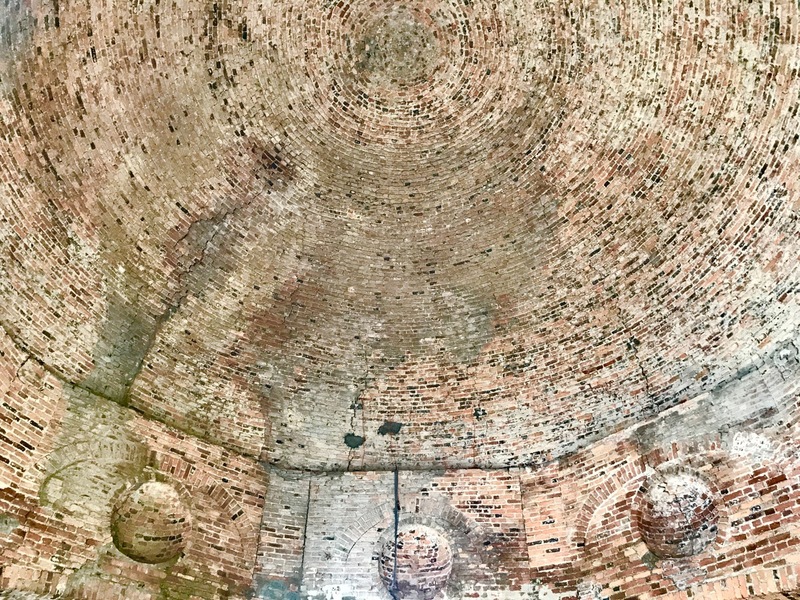 The building was listed in 1977, and was acquired by the National Trust in 1980 which has been engaged in continual efforts to preserve the remaining fabric ever since. 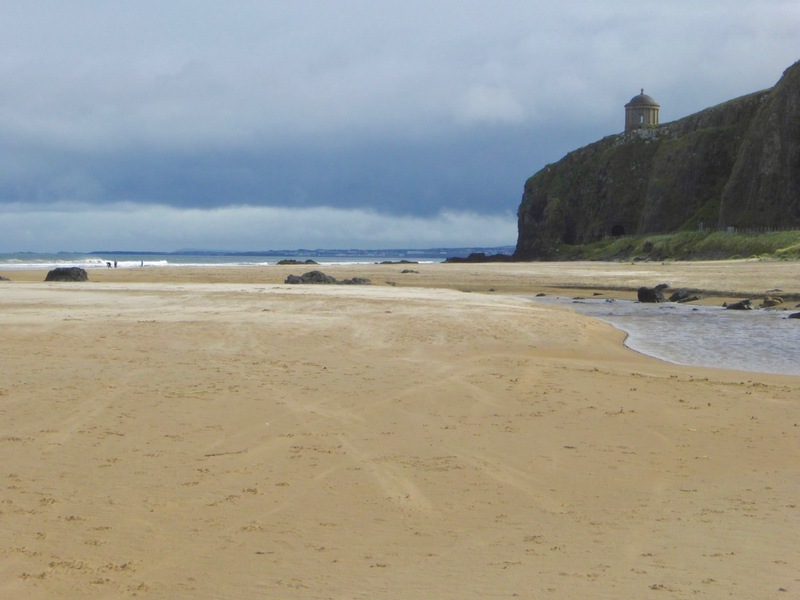 Wherever you are on the island of Ireland it’s just a hop and a step up to the North: the coastline is stunning, and a journey there will be punctuated, as always, with fascinating history. Well worth a visit! 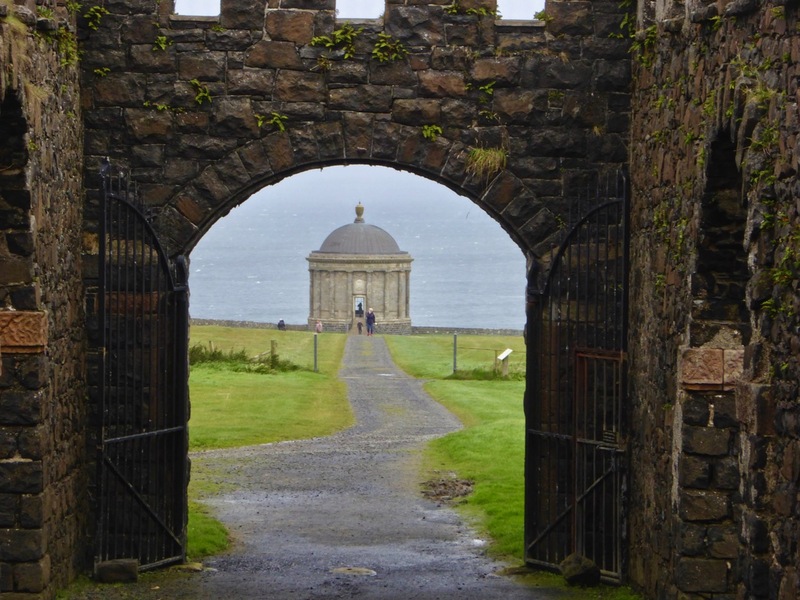 This entry was posted in Architecture, Irish History, Irish Landscape, West Cork Blog and tagged Bishop of Cloyne, Bishop of Derry, Downhill Demense, Earl Bishop Heritage Trail Group, Frederick Augustus Hervey, Michael Shanahan of Cork, Mussenden Temple, Northern Ireland, Placido Columbani, Temple of Vesta, The Earl Bishop, The National Trust. Bookmark the permalink. Fascinating stuff. I was intrigued by the railway line and I read that indeed Downhill had its own station until 1973. One day I really must mooch a bit around that end of Ireland. That must have been a wonderfully scenic railway line! The coast road in that area is stunning too! Robert, have you noticed in the photos of the Temple at the cliff edge, that what looks like a white-faced monk is clambering up the cliff whilst a ‘bird of prey’ sits quietly below him? I didn’t see them there on the day, Kathie! That’s quite a hefty stones throw from Nead an Iolar! What an astonishing place and sad to see it brought so low. The temple looks perilously close to the edge. 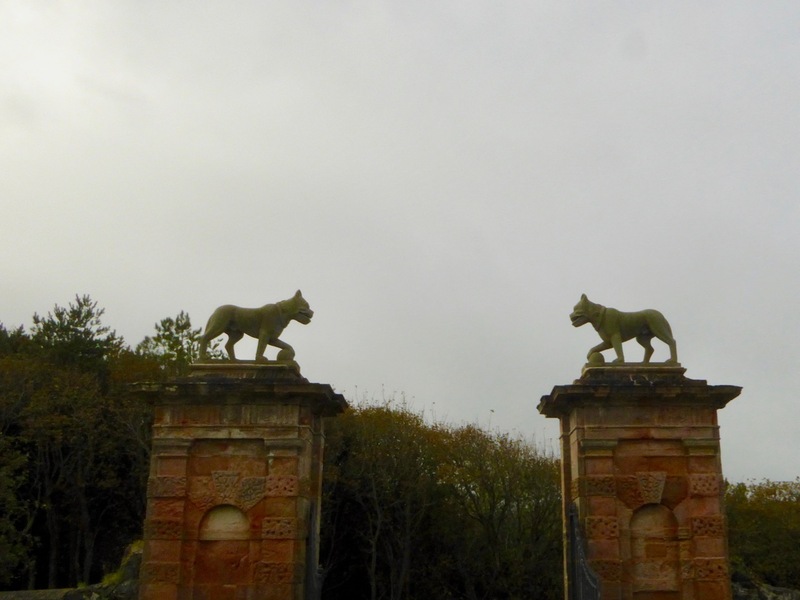 Supposedly, the National Trust has ‘stabilised’ it – can’t quite work it out. Perhaps they’ve embedded some huge pieces of steel into the cliff face – and disguised them! Distance is just a little, relative thing…. Hello Patrick. I think I say it’s just a few stones’ throws. Now, we are in Ireland so you have to make allowances. 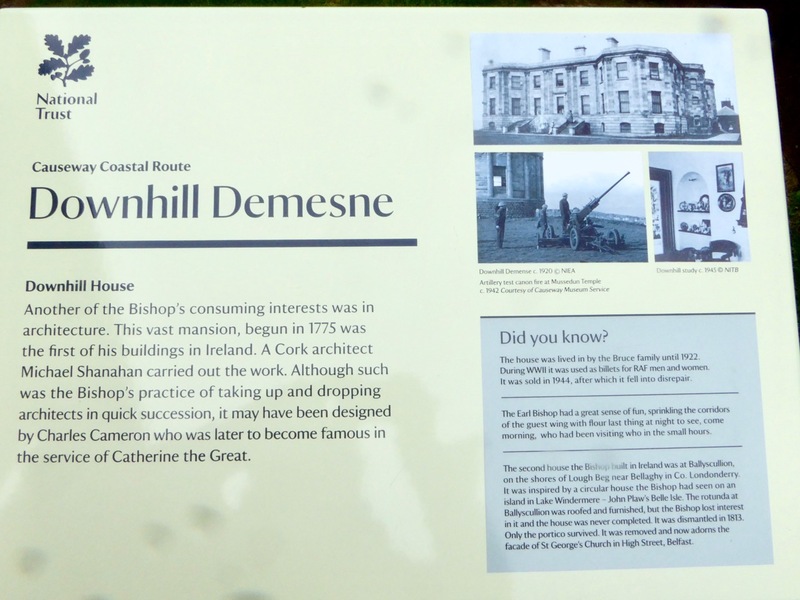 Ok – we are down in the far south west and the Downhill Demense is up in the far north. Does that help?